Karli has lived in the Bryan/College Station area for most of her life with the exception of Galveston for a couple of years. She obtained her B.S. in Wildlife and Fisheries Sciences from Texas A&M in 2014. Karli loves helping patients find just the right frame for their specific style while keeping medical necessities in mind. 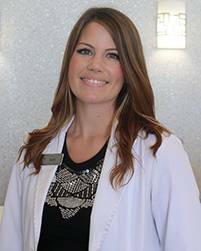 Her responsibilities include: collecting insurance plans and giving patients their best financial options for their given situation, taking proper measurements for eyewear, minor adjusting of eyewear, as wells as daily administrative tasks. In her spare time she enjoys beekeeping, learning to play guitar, and traveling the United States.